The Diamond Mile, sponsored by the Betting Gaming and Lotteries Commission and Supreme Ventures Limited, offers different strokes for different folks. Some people are totally immersed in the racing component while others are captivated by the food and or fashion. 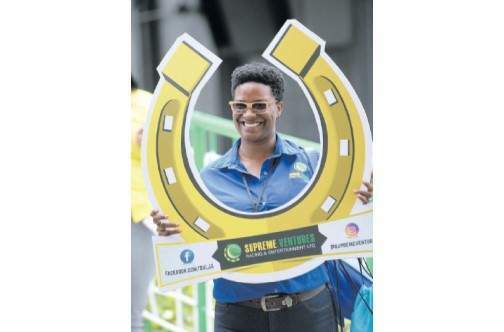 For marketing assistant at the promoting company, Supreme Ventures Racing and Entertainment Limited (SVREL), Kimberlee Sharpe, it is about the fashion statements made on Diamond Mile Day, a long but rewarding day. “I am very excited that Diamond Mile Day is finally here. I feel like the punters, the trainers, the owners and all those people who are looking forward to the event. “It is a level of excitement that you can’t really explain. You just wait on the day to come to see what happens. “I am excited about the fashion that will come out because it is always like a fashion show. It is a live fashion show for me, that’s what it is,” a very excited Sharpe said. On the Diamond Mile Race Day there are more races than on an average day, which means more work for SVREL team-members. “There are more races; it is more work and it is a long day. Last year, it happened so quickly, it was like “Oh, the day’s done”. It is more work but the excitement overpowers the work,” Sharpe revealed. Sharpe then explained what her job encompasses. “My section is the winners’ enclosure where I deal with the presentation ceremonies. I prepare for the day by ensuring that all the trophies are present for all the races and that the presenters are aware of the time when they should be presenting, so we can have smooth presentations on the day. “I have been doing this for a year and more and it has soaked in and I enjoy what I am doing,” she admitted. Sharpe then offered her strong backing for the Diamond Mile Race Day. “The Diamond Mile Race Day brings new people, new customers, new patrons and they bring a level to it as well, plus they use fashion to grab people in or to the sport. People are aware that the sport is there but are not aware that the sport is so exciting and that’s what the Diamond Mile is doing, grabbing the interest of the people. “From a marketing point of view, some of the plans are to have the ‘You’re The Owner’ promotion continuing as our girls in their jockey outfits will be selling tickets. We have our mobile betting, Mbet and we have gone live and we are hoping to introduce new patrons to it, getting them involved. “We are hoping to have more people coming in on the day from all over. The North Lounge should be food inclusive so that’s a pop. It is going to be a great day,” said Sharpe.